Disclaimer: Mayfair Mum received a free copy of the DVD to watch and review but all opinions are my own. 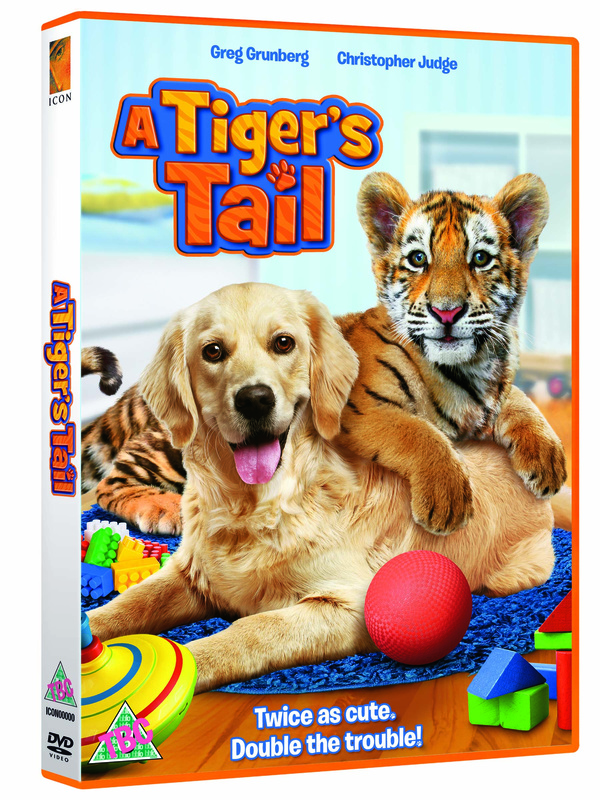 Last week saw the launch of A Tiger’s Tail to DVD and On Demand from Icon Film Distribution. I’m always a sucker for a cute animal so this was right up my street. I watched it with Little Chap so can offer you two perspectives! First, the story. Billy visits the local wildlife park with his distracted parents. Distracted himself by the local bully boys and the girl next door (who he’s trying to impress), he doesn’t notice a cute tiger cub escaping inside his rucksack. Cue the chaotic adventures he and his best friend and his dog have as they conspire to return said cub to the wildlife park before she destroys his parents’ home. From my point of view, I found it rather toe-curling. The acting was a bit lame, the script even more so but when you’re five and have grown quite used to reading story books that focus on key sounds rather than music to your ears, then I guess that doesn’t matter ‘cos Little Chap was gripped from beginning to end. The only thing he wasn’t too sure about was the noise of the barking dog – we had to fetch the ear defenders love him! So the enjoyment factor might be a bit forced in the parental camp. That said, you should definitely watch it, as there are one or two things you might want to discuss/explain with your wide-eyed and innocent young charge/s. 1. Billy’s parents are like most of us on a bad day (I.e. a little distracted by life – you know job worries, deadlines, bills, repayments etc) but magnified to the point where they fail to notice a tiger cub in the back of their car (despite Billy telling them!) and the multitude of damage done to their home as a result. The more concerned parent (as I was) might want to explore their child’s expectations of their own ‘olds’ in such a scenario – what would you do/say, what do you think Mummy/Daddy might do/say then? Little Chap scored 10/10 for understanding, explaining how Mummy would definitely turn the car straight back to the wildlife park, so I am now a less concerned parent myself. 2. Less comfortably, the best friend is overweight. Portrayed as lonely, bullied (but to his credit, brave and resilient) and with frankly gross eating habits. The good learning points are definitely talking about how cool he is to stand up and be himself in the face of aggression and threat. 3. Even worse, there are nasty bullies. Now these guys are not going to teach your kid/s any nice manners but they will enable you to talk about their horrid behaviour and hopefully agree that your child should never behave like them! From Little Chap’s point of view it was “the best film we’ve ever watched, Mummy” but then he only really watches cartoons, so a “real life” adventure with real people in it, not to mention a tiger cub, must have seemed pretty cool. Bottom line this film is never going to win an Oscar but it’s harmless fun and has everything you want in an adventure film – a hero, a pretty girl, a team of goodies and a host of baddies and of course it all comes good in the end but then you knew that already! This entry was posted in Little Chap Sees, Reviews & Recommendations and tagged adventure, adventures, animals, DVDs, humour, Icon Film Distribution, kids' films, new release, tiger cub by Mayfair Mum. Bookmark the permalink.